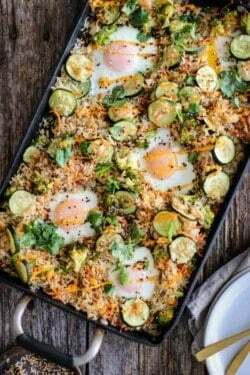 Let’s talk about one of my daughter’s FAVORITE meals, fried rice, but specifically this oven baked Sheet Pan Fried Rice!! 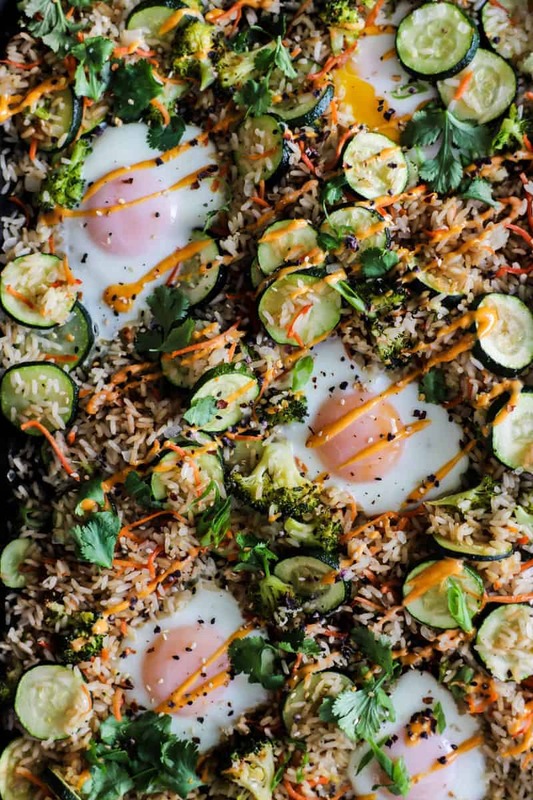 Oh yes…fried rice, you can make in the oven ON a sheet pan!! Hallelujah!! My daughter is a self professed fried rice aficionado. (AKA: fried rice snob!) She has her favorite restaurants to order from and has never really 100% approved of my fried rice ventures at home until now. 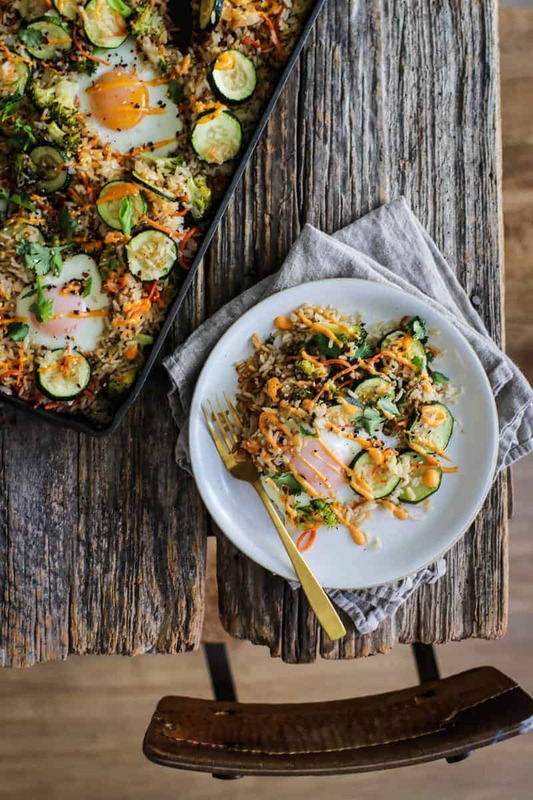 Here’s why I think YOU are going to love this Sheet Pan Fried Rice too! 1. You don’t have to cook and cool rice in advance…the planning for fried rice is really the hardest part for me. I mean seriously, when the craving for fried rice hits it HITS HARD and I want it then not a few hours from then after I cook and cool the rice completely. 2. I hate standing over a sputtering skillet or wok, it’s just too HOT! This Sheet Pan Fried Rice recipe does all of its magic in the oven, with just a little stirring involved. It’s a total game changer! 3. I find fried rice cooked on the stove top to be a bit greasy for my personal taste. 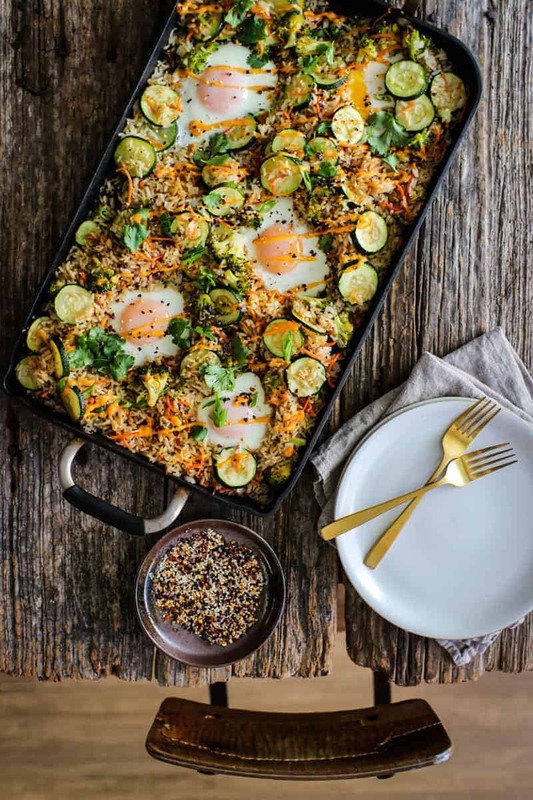 This oven baked Sheet Pan Fried Rice has all of the flavors and texture that we love, without the heavy greasiness. 4. This fried rice can easily serve as a vegetarian main course or if you have a meat eater or two in your crew, it would be amazing paired with this gluten free orange chicken! Forget making fried rice on the stove top! This oven baked version is easy to make, feeds a crowd, and is pretty darn good for you too! Preheat the broiler on high and place a rack in the center of the oven. Place a large sheet pan OR you can use an 18 x 10-inch double burner griddle like I did, in the hot oven for 5 minutes. Drizzle the oil on the sheet pan and add the zucchini, carrots, and onion. Sprinkle with the salt. Place the pan in the oven and broil for 4 minutes. Remove from the oven, stir the vegetables and add the rice. Carefully breaking up the rice as you take it out of the packages. Stir to combine then spread into an even layer. Transfer the pan back to the oven and cook under the broiler for 15 minutes, stirring every 3-4 minutes. Add the garlic, Tamari, and sesame oil to the pan. Stir to coat. Spread back into an even layer then use the back of a spoon to make 5 wells in the rice for the eggs. Crack an egg into each indention. Reduce the heat of the oven to 400°F and place the pan back into the oven for 7-8 minutes until the whites are set but the yolks are still runny. To serve drizzle Sriracha mayo over the top of the fried rice then sprinkle with sesame seeds , cilantro, green onion, Thai basil leaves/blossoms, or Togarashi if using. To make your own Sriracha mayo at home: Stir together 1/3 cup mayonnaise, 1 tablespoon Sriracha, and 1 tablespoon water. Are you loving sheet pan meals? We are too!! Here are a few of our favorites. 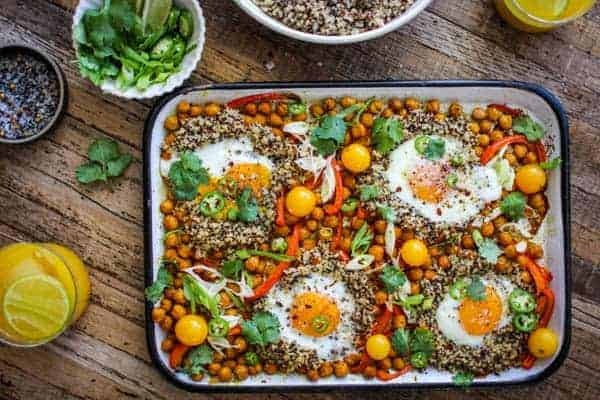 Indian Spiced Chickpeas and Eggs || Perfectly baked eggs nestled in crispy quinoa nests with spice scented chickpeas. This sheet pan meal is great for breakfast, lunch, or dinner!! Vegetarian Sheet Pan Tacos || Hasselback veggies are huge in our house! 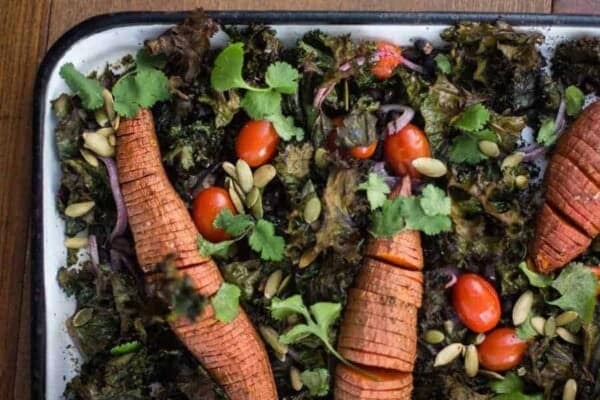 This sheet pan situation is loaded with perfectly roasted hasselback sweet potatoes nestled in a bed of black beans, roasted tomatoes, and crispy kale. Serve with tortillas for an out of this world Taco Tuesday feast.